The threat of a Digimon going rogue and building a giant robot that will destroy the human world sounds like an entire arc's worth of story material. There's an episode where the heroes discover how innocent people are blindly convinced to assist the construction effort. There's an episode where the villain is revealed to be a former ally that has grown hungry for power. There's an episode where the heroes realize in horror that the finished product is an incarnation of a dangerous enemy from the past. There's an episode where the villain loses control over his creation and is swayed back to the side of good. And of course there's the climactic episode where the good guys triumph. As far as story arcs go, Digimon has done far worse. All of these things happen in one go here. And quite frankly, it's pretty terrible. While the first two episodes weren't great, there was enough in them to suggest that Hunters was developing something interesting. There were a lot of questions unanswered, but at least made us want to watch more to find the answers. This episode posed a lot of questions as well, but these were more like head-scratchers that leave us confused and annoyed. Question 1: why is Pinnochimon suddenly craving power? Since we last saw it, Dust Zone has been reformatted several times by both Bagramon and Shoutmon. If it still exists, we have to believe it's not the Mad Max world we remember. Pinnochimon's history in the Digimon franchise makes it totally feasible that he'd revert back to more sinister intentions, but between his friendship with Taiki and Shoutmon's benevolent rule, there has to be a story behind it. We need that story! With him not remembering Taiki, the corrupting influence of a still-unnamed final boss is a likely factor, but there are no gears or rings involved to indicate as such. It's hard to swallow such an influence being negated by a Taiki Kudou friendship speech. We're also left wondering what he's trying to accomplish as he's not the one proving his strength... he's just driving a strong Digimon created by tools. Question 2: how much power does Pinnochimon really have? Convincing some discouraged hobbyists to try something his way is fair, but they're outright brainwashed. If there's no special voodoo influencing these kids, there has to be a line somewhere where they realize what they're doing. Their original robot was designed for a simple task rather than a BattleBots competition, so why are they cheering on GigaBreakdramon as it fights Arresterdramon? Pinnochimon also seems to be able to draw Tokio and the others to a specific point in DigiQuartz, an ability applied inconsistently in future episodes. Question 3: why is Taiki holding Tagiru up as a figure to be admired? At the start of the episode, Tagiru gets out of detention by agreeing to run an errand for the teacher, then turns around and tries to pass said errand on to Yuu (for a stunt like that, Yuu absolutely should have punched Tagiru in the face). How irresponsible can you get? Yet Taiki is telling this team of talented, handy robotics enthusiasts that they could learn something from Tagiru's passion and willingness to fight his own battles. Taiki then proceeds to do all of the work to subdue the threat, handing Tagiru victory on a platter. Question 4: why is nobody recognizing how serious a threat GigaBreakdramon actually posed? 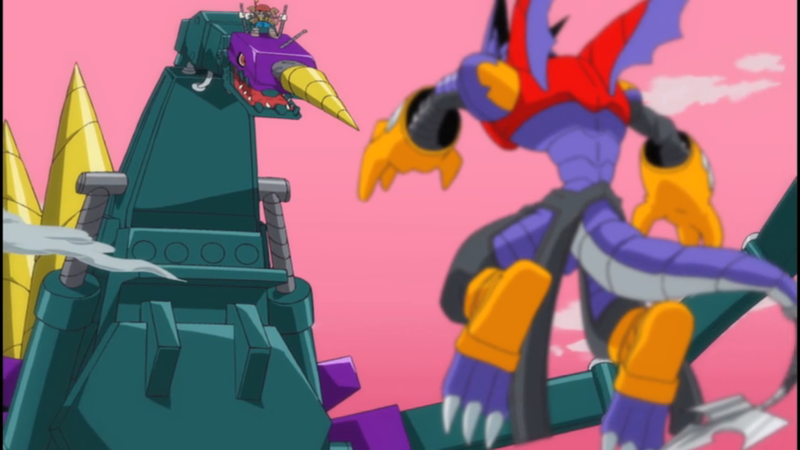 Breakdramon only featured in one episode, but it's stated that he was the big monstrosity that split the Digital World into zones in the first place. That's some world-shattering power we're dealing with here, and handled even more casually than the first time Xros Heart met him. Perhaps the most important question coming out of this episode is whether Hunters actually knows how to tell a story. There's a bit of impressive restraint in showing what the robot club was actually able to produce. Their little shovel-bot is fairly representative of their ability and not a whirring death machine some of the writers probably wanted to give them. Add “following people without being spotted” to the list of things Tagiru can't do. 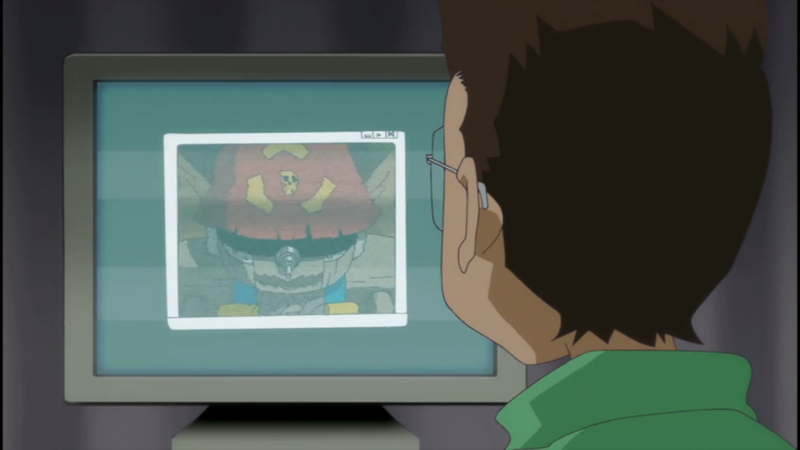 It's a wonder Tokio didn't hear him going on about their awesome detective work. For that matter, how does Tokio's mom not hear him re-entering the house, presumably with his shoes on? Tokio doesn't come across as the most athletic of kids, so climbing should have been a clumsy pursuit. The way Tagiru falls for Pinnochimon's lies so easily makes us wonder if even the show itself is trying to get us to root against him. 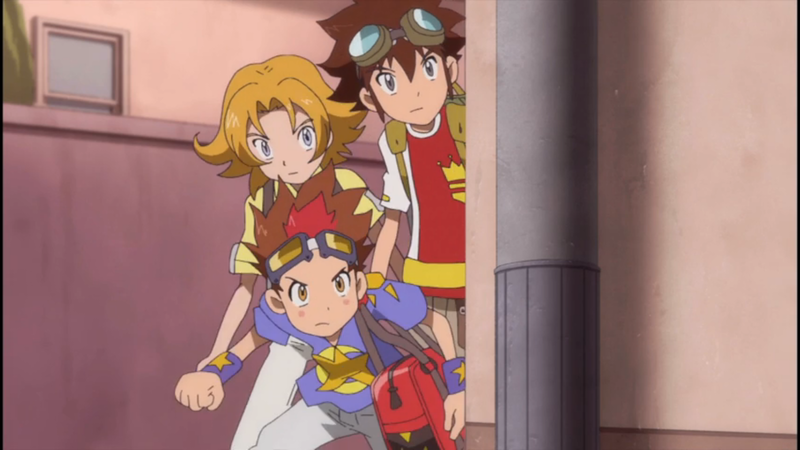 Is anybody going to call out Tagiru and Team ARR (our new term for the Airu/Ren/Ryouma collective) for prioritizing hunting GigaBreakdramon over not letting it destroy everything in sight? Yuu tried once and got cut off, but shouldn't somebody give it another go? There's something fascinating and oddly progressive about the robotics club having girls participating in these engineering projects (it's not as automatic in animation as it should be). Wonder if that was an actual discussion or the animators just plopped in whichever stock kids they had.